When using Droid Transfer, if some of your messages are not displaying, it could be that you are using Advanced Messaging messages. Droid Transfer supports standard RCS (Rich Communication Services) messages, implemented by operators such as Sprint, Verizon and Vodafone, but does not currently support operator-specific extensions to this type of messaging like AT&T's Advanced Messaging. For this reason, Advanced Messages are not displayed fully, or copied with Droid Transfer. You can confirm the type of message by going to the Messages App on your phone and long pressing a sent message to display the message properties. The message type may display "Advanced Message". AT&T's version of Advanced Messaging is attempting to make a richer messaging experience on mobile. It is based upon RCS messaging, but as it is a non-standard implementation of RCS, it is currently not fully supported. Droid Transfer supports SMS, MMS and standard use of RCS. It is possible to turn off Advanced Messages in your device's settings / options as shown in the screenshot below, so that any future messages can be backed up by Droid Transfer, however please note that changing this option will not convert your existing Advanced Messages into standard SMS / MMS messages. Update: We have recently had reports of users being able to gain access to Advanced Messages by ensuring that they are downloaded to the Android phone, rather than stored in the AT&T cloud. 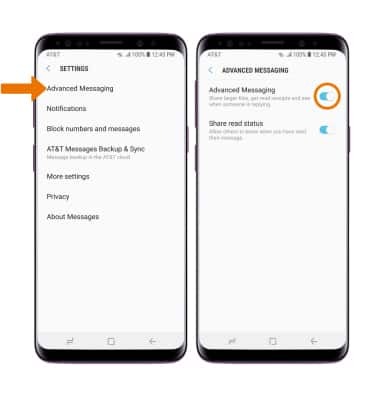 To do this, you can try turning off "AT&T Messages Backup & Sync" in your messages app, as seen in this article: AT&T Messages Backup & Sync. Let us know at whether this works for you!